Using either Infrared or Projected Capacitive technology, this table can be purchased or rented with a 55″ screen and a table height of 660mm as standard. 800mm table height version available. 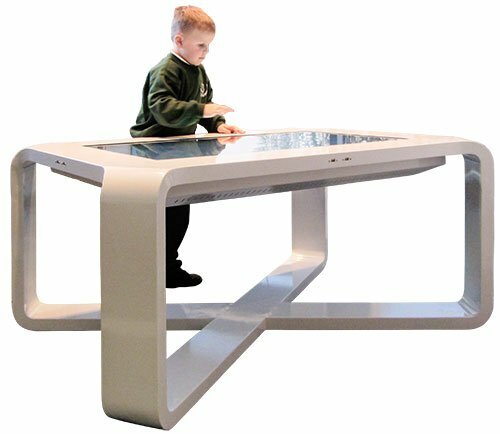 The X table is a complete off the shelf multitouch table solution that is bundled with one of the many multiuser multitouch packages we offer with all of our products. The ProMultis X-table delivers a unique user experience, where the physical and digital worlds blend. Encouraging interaction and exploration, our multitouch tables are guaranteed to draw a crowd and retain that crowd for a longer time! With the Promultis X-table, users can customize their own experience and remain in control of which content they see by using natural gestures such as pinch, zoom and drag. With a bright, clear 1080p LED screen, the Promultis X-table provides a large working surface area allowing several users to collaborate from any angle.